It is organised into one or more layers that can be viewed or hidden one by one. Certain available information can be consulted and the map image characteristics. One specification of Open Geospatial Consortium (OGC) establishes what a standard and interoperable WMS should be like, allowing visual overlaying of vector data, raster data, in different formats, with different Reference System and Coordinates and in different servers. Returning metadata from the service (GetCapabilities operation). Obligatory. Returning a map from some geographic and dimensional parameters defined (GetMap operation). Obligatory. Returning information on particular characteristics shown on the map (GetFeatureInfooperation). Optional. This service provides access to all SITNA’s information published through WMS. This service includes only those spatial datasets published following INSPIRE Directive data models. At this moment, it is available for Cadastral Parcels theme. A Catalogue Service permits the publication and search for information (metadata) that describes data, services, applications and in general all types of resources. 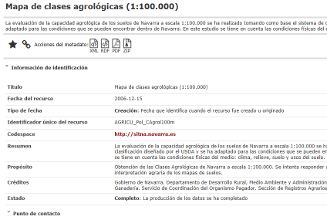 The catalogue services are necessary to provide search skills and invocation over the resources registered within an SDI. According to OpenGIS® Catalogue Services Specification 2.0.2 Catalogue Services are the keystone to be able to locate, administer and maintain distributed geo-sources (spatial data, applications and services). By means of using OGC service catalogues, the user can run searches on geo-sources in a standardised way. They are based on a very well defined information model that includes spatial references and topic-based description, collected in the metadata that permit the user to run searches efficiently. Query metadata from the service (GetCapabilities operation). In the same way as the WMS services, the WFS services are defined by their corresponding specification. WFS services offer the ability to access and consult all the attributes of a geographic phenomenon (feature) such as a river, a city or a lake, represented in vector mode with geometry described by a set of coordinates. Usually the data provided is in GML format but any other vector format can be valid. A WFS not only allows you to view the information as in a WMS but you can also consult it freely. This service provides access to all SITNA’s information published through WFS. According to its specification this OGC service allows the obtention of geospatial data in a coverage format that represent phenomena with space and time variation. In this way it is useful for digital representation of this type of geographical information as input data in scientific models or for other type of clients. Consult metadata of the service (GetCapabilities operation). SITNAs WMTS service offers several layers, including the latest orthophoto and a basemap, according to the standards defined by the OGC. The Map Tile Service (WMTS) is based on a tile model with a hierarchical structure that pre-renders and breaks up geographical data into a specific pixel size for a given set of scales. The main advantage of this service in comparison to the WMS service is the response speed.